Alpine Ascents Base Camp Set up was impressive none of the other teams looked nearly as nice as our and could not imagine having better food day in and day out. – 2018 Climber. Our expedition begins with a flight from the US to Kathmandu, Nepal. We’ll spend a few days in Kathmandu checking gear, meeting the Sherpa, and preparing for our flight to Lukla (9,000 ft./2,740 m), which is at the base of the Khumbu Himal. From there, we’ll begin our trek to Everest Base Camp. The trek takes approximately 10 days and goes from the Dudh Kosi valley up through the Imja Drangka and onto the Khumbu Glacier. Along the way, we’ll visit the villages of Namche, Tengboche, Pheriche, and Lobuche, most of which are fascinating and richly cultured villages that provide spectacular views of the Himalayas. The trek in also gives us the chance to explore the many different regions and the time to visit local monasteries and visit with Nepali friends. Years of experience have helped us to establish the finest Base Camp on the mountain. With the highest quality tent structures and imported foods, we strive to ensure that your time at Base Camp is restful and revitalizing. We have a full-time Base Camp manager and have a full communications tent for email and limited phone calls. By the time we reach Base Camp (17,598 ft./5,364 m), our climbing leaders and Sherpa will be well on the way to having the lower part of the mountain (the Khumbu Icefall) already fixed with ropes and ladders. We’ll establish four camps on the mountain. The first, Camp I at 19,500 ft./5,943 m, is situated at the top of the icefall. This camp functions as an intermediate camp until Camp II (Advanced Base Camp) is established at 21,000 ft./6,400 m in the Western Cwm. Camp II will consist of large tents for cooking and dining and several smaller tents for sleeping. Camp II will be our base during the placements of Camp III and Camp IV (23,500 ft./7,162 m and 26,300 ft./8,016 m respectively). Camp III, which stands at the head of the cirque on the Lhotse Face, will consist of three- and four-man tents. This intermediate camp helps us to reach Camp IV (High Camp) on the South Col. Most of our Sherpa are able to carry directly from Camp II to Camp IV, so we will not need large amounts of gear at Camp III to establish Camp IV. Oxygen will be used above Camp II to help aid climbers in reaching High Camp before attempting the summit. From Camp IV, we travel along the Southeast Ridge to the South Summit. From here we traverse for a few hundred meters before reaching the Hillary Step and then onto the main summit. After Camps III and IV are established and all our supplies are in place, we’ll return to Base Camp for a rest. At Base Camp, we’ll organize our summit teams and prepare ourselves for summit attempts. Once we are ready, we’ll return to Advanced Base. If good weather prevails, we’ll move the summit team to Camp III. On the next day, the summit team moves up to Camp IV. Once at Camp IV, we’ll take a rest day. We have found that this rest at Camp IV greatly increases our chances of summit success. The following day will be summit day. We start very early that morning and attempt to reach the summit before midday. After the summit, the team retreats back to the South Col and next day descends to Camp II. Guides and Sherpa will accompany all summit attempts and climbers will use oxygen. Upon sign-up, we will send you our richly detailed Climber Information Package. Arrive Kathmandu. You’ll check into the renowned Yak and Yeti Hotel, a cornerstone of the Kathmandu scene, and attend a welcome dinner with other trekkers and climbers. Kathmandu. From the centrally located Yak and Yeti, we’ll begin our exploration of Kathmandu. While modern by Nepalese standards, Kathmandu is a sacred city to Hindus and Buddhists. Our tour is an important introduction to understanding the cultures that lay ahead. Kathmandu is prominently featured in Buddhist scriptures and Hindu texts such as the Ramayana. Our tour includes 3,000-year-old Swamayabhu (monkey temple), the great Stupa of Bodnath, and a local school. In the morning, we’ll take an acclimatization hike, gaining 1,000 feet to take in the amazing mountain vista. In the afternoon, we’ll have time to visit sights in Namche Bazaar, including the local marketplace. We’ll continue on and climb to the village of Tengboche (12,683 ft./3865m), the cultural and religious center of the Khumbu. At the monastery we’ll attend Buddhist ceremonies and rituals performed by local monks. Vistas from Tengboche are spectacular. The jagged peaks of Thamserku and Kangtega stand to our south, as Everest, Lhotse, Nuptse and Ama Dablam are visible to the north. The Monastery at Tengboche is one of the most well-known in the world, as the Rinpoche is revered throughout the Buddhist community, and has authored a number of books and essays. We’ll climb to the village of Pheriche (13,907 ft./4,238m), which is not far from Dingboche (a village en route to Island Peak). Pheriche has become famous for its high-altitude medical clinic. The clinic attracts world-renowned physicians who from time to time acquire data to analyze the effects of high altitude on human physiology. We’ll visit the clinic and learn more about the effects of high altitude on Himalayan climbers. Hiking time: 4 hours. We’ll also spend an additional day further acclimatizing and hiking. We’ll leave Lobuje and eventually cross the moraine of the great Khumbu Glacier to reach Base Camp, which lies beneath the sweeping ridges of Everest and Nuptse. Everest Base Camp at 17,598 ft./5,364 m, is a sprawling tent city set amidst glacial debris. There, the climbers will begin final preparations for their ascent of Mt. Everest. Conditions permitting, we will venture to the edge of the notorious Khumbu Icefall to see climbers en route as they negotiate this complex maze of ice. Overnight at Base Camp. Hiking time: six hours. Years of experience have helped us to establish the finest Base Camp (17,598 ft./5,364 m) on the mountain with the highest quality tent structures, including private sleeping tents. Our dinning tent is carpeted and heated with Wi-Fi and a movie screen is available. We provide hot showers at your request. We have western-trained cooks that prepare fresh local products as well as imported foods. We strive to ensure that the time at Base Camp is restful and revitalizing. By providing these accommodations, we make every effort to keep climbers healthy and rested. Here we take a leisurely day at Everest Base Camp, enjoy morning tea at our tent, and spend the day checking out the life at Base Camp. We will spend time watching the daily preparations of our climbing team, taking a look at how meals are prepared, and have a chance to meet our Everest Sherpa staff. General Climbing Schedule: schedule on the mountain is approximate and subject to changing conditions. Delays/early departures can occur. Climbing route: By the time we reach Base Camp, our climbing leaders and Sherpa will be well on the way to having the lower part of the mountain (the Khumbu Icefall) already fixed with ropes and ladders. We’ll establish four camps on the mountain. The first, Camp I, at 19,500 ft./5,943 m, is situated at the top of the icefall. This camp functions as an intermediate camp until Camp II (Advanced Base Camp) is established at 21,000 ft./6,400 m in the Western Cwm. Camp II will consist of large tents for cooking and dining and several smaller tents for sleeping. Camp II will be our base during the placements of Camp III and Camp IV (23,500 ft./7,162 m and 26,300 ft./8,016 m respectively). Camp III, which stands at the head of the cirque on the Lhotse Face, will consist of three- and four-man tents. This intermediate camp helps us to reach Camp IV (High Camp) on the South Col. Most of our Sherpa are able to carry directly from Camp II to Camp IV, so large amounts of gear are not needed at Camp III to establish Camp IV. Oxygen will be used above Camp II to help aid climbers in reaching High Camp before attempting the summit. From Camp IV, we’ll travel along the Southeast Ridge to the South Summit. From there, we’ll traverse for a few hundred meters before reaching the Hillary Step and then onto the main summit. Summit attempts: After Camps III and IV are established and all our supplies are in place, we return to Base Camp (and lower villages) for a rest. At Base Camp, we’ll organize our summit teams and prepare ourselves for summit attempts. Once we are ready, we’ll return to Advanced Base. If good weather prevails, we’ll move the summit team to Camp III. On the second day, the summit team will move up to Camp IV. Day 3 will be summit day. We’ll start very early that morning and attempt to reach the summit before midday. After the summit, we’ll retreat back to the South Col and the next day descend to Camp II. Guides and Sherpa will accompany all summit attempts and climbers will use oxygen. In good conditions, we are back at the South Col between noon and 2 p.m. From here we have a variety of choices, depending on weather and strength of climbers. We can rest for a few hours at the South Col, then do the two-hour traverse to our Lhotse High Camp. Or we can spend another night at the South Col, move to Lhotse High Camp the next day, and summit the following day. After final administration requirements, we’ll fly via Twin Otter to Syangboche and overnight Namche(11,300 ft./3444m). The village of Namche is an historic trading post where Nepalese and Tibetan traders exchange salt, dried meat, gold, and textiles. Besides being a superb place to shop for traditional crafts, Namche remains the central trading post in the Khumbu, attracting Himalayan and lowland merchants. Our group will spend two days in Namche, affording us the opportunity to acclimate, visit local markets, and spend time with friends in town. On the hike, we’ll capture our first glimpses of Everest and neighboring peaks. Namche in the morning, then we’ll take an acclimatization hike, gaining 1,000 ft. to take in the vista on the patio of the Everest View Hotel, or take a similar-altitude trek. In the afternoon, we’ll have time to visit sights in Namche Bazaar, including the local marketplace. On perhaps one of the most fascinating days of the trek, we’ll travel to the village of Thame (12,464 ft./3,800 m), off the main trekking path. We’ll have the unique opportunity of visiting the home of Lakpa Rita Sherpa, our Sirdar (lead Sherpa) and Everest climbing guide. His family has been a mainstay of this small community, raising yaks and farming. This gives us an intimate view of Sherpa culture through the lens of a traditional home. Interestingly enough, a number of famous climbing Sherpa have come from Thame. The Thame experience is one rarely afforded to trekkers. After afternoon tea, we’ll climb to the Thame monastery and further explore local Buddhism. We’ll tour this 400-year-old gompa (monastery), and learn about its inner workings and the lives of its monks. As we view the monastery we’ll discuss the wall paintings and artifacts that are central to Buddhist practice. We’ll hopefully have the opportunity to receive a blessing from the Thame Rinpoche (head priest). Hiking time: five hours. From Thame, we’ll walk to the beautiful village of Khunde (12,400 ft./3,780 m), one of the largest villages in the Khumbu and home of Sir Edmund Hillary’s hospital and school. The day’s walk is moderate and pretty, winding through thick cedar forest. Hiking time: six hours. We’ll continue on and climb to the village of Tengboche (12,683 ft./3,865 m), the cultural and religious center of the Khumbu. At the monastery, we’ll attend Buddhist ceremonies and rituals performed by local monks. Vistas from Tengboche are spectacular. The jagged peaks of Thamserku and Kangtega stand to our south as Everest, Lhotse, Nuptse, and Ama Dablam are visible to the north. The Monastery at Tengboche is one of the most well-known in the world; the Rinpoche is revered throughout the Buddhist community and has authored a number of books and essays. In the past, our groups have had an audience with the Rinpoche and received his blessing. Views from this locale (one of the finest on earth), include Kwangde (20,293 ft./6,185 m), Tawachee (21,457 ft./6,540 m), Nuptse (25,843 ft./7,876 m), Lhotse (27,883 ft/8,498 m), Everest (29,035 ft./8,850 m), Ama Dablam (22,487 ft./6,854 m), Kantega (22,235 ft./6,777 m), and Thamserku (21,674 ft./6,606 m). We’ll visit the community Sherpa Cultural Center and an excellent nearby bakery, and descend slightly to lodge in the village of Deboche. Hiking time: four to five hours. We’ll climb to the village of Pheriche (13,907 ft./4,238 m), which is not far from Dingboche (a village en route to Island Peak). Pheriche has become famous for its high-altitude research center. The center attracts world-renowned physicians who acquire data to analyze the effects of high altitude on human physiology. We’ll visit the research center and learn more about the effects of high altitude on Himalayan climbers. Hiking time: four hours. We’ll also spend an additional day further acclimatizing and hiking. Rest day in Lobuje, acclimatizing. Team members experience climbing through some very challenging and notable aspects of Everest and get first-hand experience of what it takes to climb this great peak, as you are traveling much of the same route as our Everest summit team. This is an excellent opportunity to see if a future Everest climb is right for you or simply a chance to climb part of this legendary peak. As always, Alpine Ascents teams will be led by veteran Everest guides and our legendary Sherpa climbing staff, who will provide the foremost in logistics and Base Camp facilities. 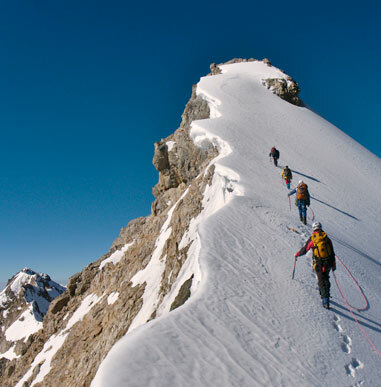 Our unique team approach to climbing the mountain has allowed us to continually operate successful expeditions while maintaining an excellent safety record. Please note that for climbs concluding at Camp II, several gear list items can be left behind. Please contact the Gear Department to discuss this. Upon sign up, we will send you our richly detailed, pre-trip Climber Information Package. After final administration requirements, we’ll fly via Twin Otter to the landing strip in Lukla. Weather permitting, this flight offers outstanding views of the eastern Himalayas. In Lukla, we meet and join our Sherpa staff, load the yaks, and begin the ascent to Base Camp. Our first day is an easy walk to lush environs of Phakding, located on the Dudh Kosi river. Hiking time: three hours. We’ll follow the Dudh Kosi, ascending 2,300 ft./700 m through Himalayan pine and doedar cedar forests, to the celebrated village of Namche Bazaar (11,300 ft./3,444 m). The village of Namche is an historic trading post where Nepalese and Tibetan traders exchange salt, dried meat, gold, and textiles. Besides being a superb place to shop for traditional crafts, Namche remains the central trading post in the Khumbu, attracting Himalayan and lowland merchants. Our group will spend two days in Namche, affording us the opportunity to acclimate, visit local markets, and spend time with friends in town. On the hike, we’ll capture our first glimpses of Everest and neighboring peaks. Hiking time: five to six hours. In the morning, we’ll take an acclimatization hike, gaining 1,000 ft. to take in the vista on the patio of the Everest View Hotel, or take similar altitude trek. In the afternoon, we’ll have time to visit sights in Namche Bazaar, including the local marketplace. After our days in Namche we’ll continue on and climb to the village of Tengboche (12,683 ft./3,865 m), the cultural and religious center of the Khumbu. At the monastery, we’ll attend Buddhist ceremonies and rituals performed by local monks. Vistas from Tengboche are spectacular. The jagged peaks of Thamserku and Kangtega stand to our south as Everest, Lhotse, Nuptse, and Ama Dablam are visible to the north. The Monastery at Tengboche is one of the most well-known in the world; the Rinpoche is revered throughout the Buddhist community, and has authored a number of books and essays. In the past, our groups have had an audience with the Rinpoche and received his blessing. Views from this locale (one of the finest on earth), include Kwangde (20,293 ft./6,185 m), Tawachee (21,457 ft./6,540 m), Nuptse (25,843 ft./7,876 m), Lhotse (27,883 ft/8,498 m), Everest (29,035 ft./8,850 m), Ama Dablam (22,487 ft./6,854 m), Kantega (22,235 ft./6,777 m), and Thamserku (21,674 ft./6,606 m). We’ll visit the community Sherpa Cultural Center and an excellent nearby bakery, and descend slightly to lodge in the village of Deboche. Hiking time: four to five hours. We’ll climb to the village of Pheriche (13,907 ft./4,238 m), which is not far from Dingboche (a village en route to Island Peak). Pheriche has become famous for its high-altitude research center. The center attracts world-renowned physicians who acquire data to analyze the effects of high altitude on human physiology. We’ll visit the research center and learn more about the effects of high altitude on Himalayan climbers. Hiking time: 4 hours. We’ll also spend an additional day further acclimatizing and hiking. Above Pheriche, the character of the terrain changes, and we begin to understand the starkness of the high alpine landscape. Our path climbs the terminal moraine of the Khumbu glacier and continues to the settlement of Lobuje (16,174 ft./4,929 m), where we’ll spend one night. 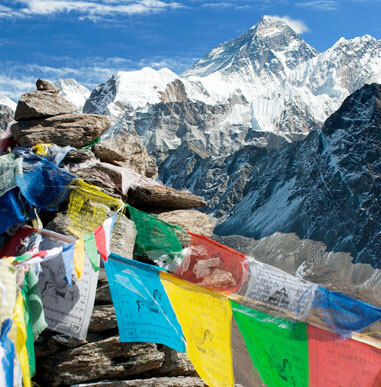 This trail passes through a famous memorial that honors the many Sherpa who lost their lives in the high mountains. Lobuje is located on the flank of an old lateral moraine of the Khumbu glacier. Hiking time: four to five hours. The trail winds past the Italian Research Center through the high tundra and glacial moraine to Gorak Shep (16,924 ft./5,158 m), the last inhabited area before Everest Base Camp. Gorak Shep presents a rougher environment and gives the trekker the true flavor of the nighttime rigors of mountaineering. In the afternoon, we’ll take a short walk up the moraine to look down on the chaotic Khumbu glacier and take in the closeness of these renowned Himalayan peaks. Hiking time: four to five hours. We’ll leave Gorak Shep and cross the moraine of the great Khumbu glacier to reach Base Camp, which lies beneath the sweeping ridges of Everest and Nuptse. Everest Base Camp at 17,598 ft./5,364 m, is a sprawling tent city set amidst glacial debris. There, the climbers will begin final preparations for their ascent of Mt. Everest. 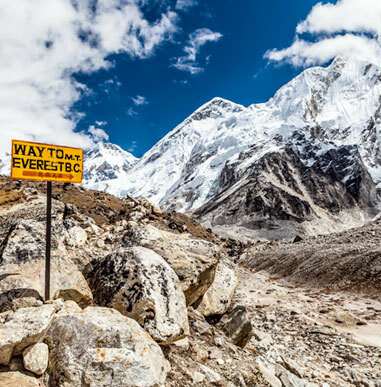 Conditions permitting, we will venture to the edge of the notorious Khumbu Ice Fall to see climbers en route as they negotiate this complex maze of ice. Overnight at Base Camp. Hiking time: six hours. Here we take a leisurely day at Everest Base Camp and enjoy morning tea at our tent and spend the day checking out the life at Base Camp. We will spend time watching the daily preparations of our climbing team, taking at look at how meals are prepared while having a chance to meet our Everest Sherpa staff. Review climbing skills at Base Camp. Rest day at Camp I. Rest day at Camp II. Many thanks for organizing the expedition. It was a fantastic experience! I am looking forward to climbing with AAI on other mountains.